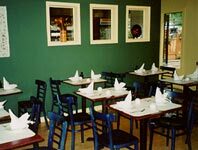 Tommy's Wok is a small, out-of-the-way place tucked inside the Redwood Court with all the charm of Carmel. Szechuan, Hunan and Mandarin cuisine is served fresh and natural. Everything on the menu is homemade - no worry here about MSG and other artificial ingredients! Tommy Mao (Chef) and sisters, Van and Joanne, have had two other successful restaurant ventures in Sausalito and Oakhurst. Tasting is believing at Tommy's Wok! from 15 - 30 people. and accompanied by both jasmine fried rice and soft noodles. With a cup of zesty hot and sour soup, this is a lunch that's more than ample for appetites with gusto and an incredible bargain...Order the potstickers, and you'll immediately understand the difference between the ubiquitous frozen variety and the real ones, like these. Dim sum lovers will have lots of fun with the lunch menu." Coast Weekly, Food, Wine & Restaurants, December 9-15, 1999. Copyright Restauranteur, 1999-2019. All rights reserved.